When the grave of the local lady of the manor is dug up so that her husband can be buried beside her, the villagers of Fenchurch St Paul are horrified to find that there is another body in the grave – one that absolutely shouldn’t be there. The vicar, who is acquainted with the famous private detective, Lord Peter Wimsey, calls him in to help solve the mystery. Lord Peter quickly finds out that not all is as it seems. There is much confusion over the identity of the body, which eventually leads Lord Peter on a trip to France. The theft of an emerald necklace several years before also appears to be tangled up in the crime. In this case, Lord Peter’s detective skills are pushed to their limits. Who was the dead man? And why was he buried in someone else’s grave? Lord Peter Wimsey is upper class and likes to make out that he is much more stupid than he really is, to confuse the criminals. He has made a reputation for himself as a detective and, having built a good relationship with the police, he is privy to facts that others aren’t aware of, and this helps him with his cases. He is quite annoying as a character; there is something so superior and perfect about him that I find it hard to like him. He also tends to take a back seat in a lot of cases, including this one, and so comes across as rather dull. Thankfully, this is one of Sayers’ stronger stories, which makes up for the rather dull main character. The ‘working class’ is represented by Lord Peter’s manservant, Bunter, whom Lord Peter met during the war. Much as I like the concept of Bunter, who is more of a friend to Lord Peter than a servant, he is just a little too rough and ready to be true. I don’t really know enough about Sayers’ background to be sure, but I suspect that she mixed in higher social circles and so tended to base her working class characters on caricatures. Nevertheless, he is a pleasant change from the rather proper Lord Peter, so on some levels, it certainly does work. The story itself is strong and I did really enjoy it. What lets it down though is the constant reference to change ringing. This is apparently all to do with the way in which church bells are rung in a pattern. However, this was over-complicated and frankly not all that necessary for the story – perhaps it is something that older generations would understand more. I skipped moste of these sections. Eventually, the bells do play an important role in the story, but the details of how they are rung seemed superfluous, and merely provided yet another excuse to show how clever Lord Peter is. In case anyone was wondering, the title of the book refers to the nine times the church bells are rung when a local man dies (women don’t get as many for some reason!). Many modern readers are likely to be hampered by the old fashioned turn of phrase that Sayers tends to use. It is understandable enough, but makes the prose stumble at times. Sayers’ contemporary, Agatha Christie, always managed to keep her prose simple, which has meant that, over time, it hasn’t aged all that much. Sayers detailed descriptions of items and clothes pertaining to the period date it much more, which unfortunately makes it less accessible to twenty-first century readers. Nevertheless, it really is worth putting up with the odd language and after a while, it becomes second nature. What I do like about the book, apart from the plot, is that it does provide an interesting insight into village life of the time – particularly the social classes. There was very much a hierarchy in that there was a lord of the manor, who everyone else bowed and scraped to, then special standing was given to professionals, like the doctor and the vicar. The others were given respect according to their age. I found all this interesting, particularly when comparing it to modern day life. I don’t really approve of the hierarchy; but it is a shame that the respect for others and neighbourliness that exists in this book doesn’t seem to be as obvious today. As a social history, it is fascinating. 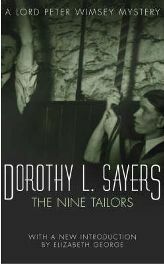 Agatha Christie will always be my favourite of the so-called Queens of Crime, but I do like the occasional Dorothy Sayers book and this one is a good example, despite its faults. The ending is very well written and absolutely impossible to guess. Recommended to any fan of crime fiction – just bear in mind that the writing may seem slightly stuffy to begin with. Published by Hodder and Stoughton, it has 299 pages. No Comments on "The Tolling of the Bells"